Posted on January 22, 2017 January 22, 2017 Categories UncategorizedLeave a comment on Repairs are done. I can keep blogging about technologies and interesting things in the IT world. A day like today Carl Sagan would have turned 76 years old. This small post is a tribute to the veterans of the world wars who fought Nazism and intolerance. Java Initialization blocks…why should we ever use them? Coming from a C# world I’m trying to get a grasp on the Java language, mostly for comparison purposes and to see if really the grass is greener on the other side of the fence. 1. The main one is cross platform portability. I wish Mono would have more support. 3. Static imports, but do they really add to maintainability or make it worse? Posted on February 3, 2010 Categories Uncategorized1 Comment on Java Initialization blocks…why should we ever use them? 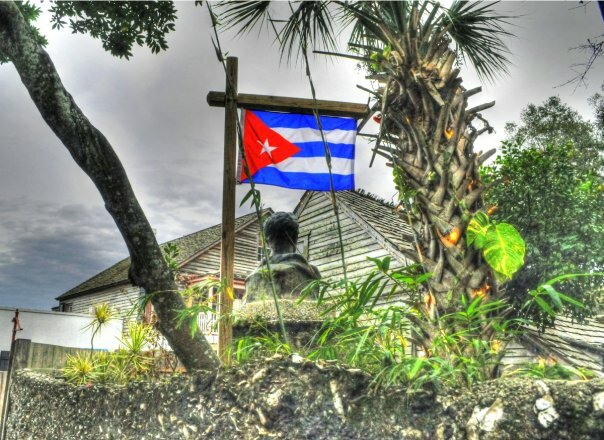 We drove to St Agustin while visiting Florida these holidays and to my surprise they had a museum with Martí and the Cuban flag :)… mi bandera. Why use the Entity Framework? Yeah, why exactly? refuting a marketing like article by one of the EF team members. After using NHibernate for a while and looking into JPA and old JDO on the Java world, I don’t think I’ll get my hands on the EF any time soon, if I can avoid it. Lack of persistence ignorance…The tight coupling of the persistence infrastructure to the entity classes largely eliminates the ability to efficiently use very tight feedback cycles on the business logic with automated testing. …if I’m a traditional TDD methodologist (for lack of a better term) and I’m building up my code base with test-first mentality then it’s all about the code. The automated tests are used for documentation of things like requirements, user stories, etc. Agile folk try to avoid documents like conceptual models, our conceptional model is the code, it’s our classes. I don’t need another conceptual modeler and I don’t need to have a modeler create new classes for me, I don’t need it to modify my classes, the classes I’ve defined for my application do exactly what they need to do. As we build up our classes to reflect what the domain is, as we know it now, we eventually want to add the ability to persist those objects to a store of some sort. It’s at that point we being to think of OR/M. But we want to keep that persistence separate from our abstractions, keeping true to the single responsibility principle and separation of concerns. All the trappings of persistence are abstracted somewhere else. Ignorance is bliss and in this case persistence ignorance is a bliss I won’t give up on. The nasty truth about misapplying duct tape solutions in serious software development is that the duct tape solution ends up creating unnecessary additional complexity because it doesn’t address the whole problem, just the symptoms. This isn’t unique to software development, but if duct tape solutions are used to achieve short term gains, then future solutions are built on a foundation of duct tape instead of some sound organizational method. It is the work of the architect and team leads to ensure the solutions are not addressed with duct tape/patch programming approach, but there is a design and long term planning associated to every project. I’ve seen too many solutions already that fail on deployment due to data center constraints the developer was not aware of, where were the architects here? Have fun while learning, are you certifiable? I got this ad from a marketing person. I wasn’t going to post it as I’m not very fond of sales and marketing people. If you like games, you might enjoy this one. Check out the game at www.areyoucertifiable.com. Enjoy! Posted on February 19, 2009 March 7, 2012 Categories UncategorizedLeave a comment on Have fun while learning, are you certifiable? I’m trying to fix my dad’s website, after his gallery suffered a sql injection and his database is no longer with us. I needed to check if port 2077 was open on the server to map a folder as a drive on my windows explorer after a few problems with my ftp connection timing out. Click Turn Windows Feature on or off. Check mark the telnet client.